First Happy New Year to all my Homo sapien friends, and of course to all the wild critters out there. May you make it through the Winter struggle to enjoy the eventual warming of Spring. Calling a local coyote “Wiley Coyote” is my act of anthropomorphizing or giving him the human attribute of wiliness or the ability to beguile or trick his way around as some of we Homo sapiens are wont to do. In fact he has no such intent or even ability. One raced close by me, on one of my morning jaunts, paying me no heed. Upon my recovering from initial surprise and, yes, fright, I calmed myself by conjuring up in my mind that Wiley had given me no time to inquire as to what he was up to. What his haste was all about had me wondering, as no prey critter was running to escape him. He sure as heck was not in any “Wiley” mode. To attempt to get into the inscrutable mind of a wandering bear, a grazing deer, or a running coyote is just a fun endeavor with no possibility of success —as much as we might try. We have the habit of anthropomorphizing our pets, especially our dogs, cats, and for some, even their horses. I admit to this guilt and it started when I was a young teenager raising guinea pigs and mice of many colors. My first acquisition was a white female mouse that I tagged “Mighty Whitey.” She lived 2½ years and bore many young. She was essential in my effort to cross breed mice of many colors: white, and brown and black, always with the goal of producing Dutch mice, the jargon for tricolored mice. I was eventually successful, even impressing my biology teacher in high school with my in – depth understanding of dominant and recessive genes. I was very depressed when Mighty Whitey died of old age. Somehow I thought she would live forever. I considered her one of my best friends. She would recognize me when I approached the big fish tank that was home to her and others, eagerly jumping up on my hand when I offered it. Others had various and recognizable personalities: some were bullies, others very shy, attributes similar to some of my classmates in school. I recall being puzzled by two that were binary or sexually trans, something that I now realize is a natural phenomenon and occurs in our own species. Was I anthropomorphizing them? 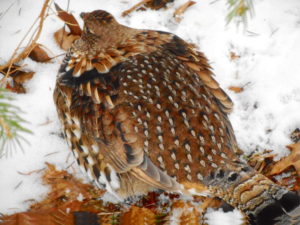 Presently and locally I have been taking note of an abundance of ruffed grouse out and about. One even scared the H out of me when it noisily blasted out of our breezeway, which was an improper refuge. Some males have been strutting, showing their stuff although the Spring mating season is still distant. Two crabapple trees still hold very small and somewhat dried-out fruit—a delightful buffet. Other very important attractions are the Norway spruce trees we planted as seedlings some thirty years ago. 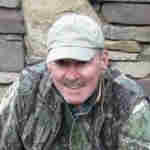 They hold their lower limbs which retain their needles, thus providing perfect cover for the grouse and other critters. Norway spruce, although an exotic species from Europe —I suspect Norway—is the perfect conifer if you are doing some planting come Spring with wildlife habitat in mind. Forget the blue spruce, as they die off early from the bottom up. Although I have not seen an abundance of cottontail rabbits about, they are another species that will have a better chance of surviving predator onslaught under the cover of these trees. I discovered another place of cover as I was piling my summer tires for storage in the pole barn, surprised by a rabbit that had been taking refuge under the brush hog still attached to the tractor. I will call him or her a survivor rabbit and wish it further luck. 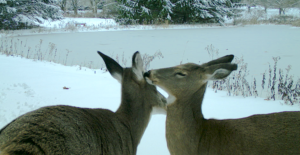 I got a call from my friend Lore who is an ardent observer of our local wildlife. Lore lives over the hill in the next hollow and had a very interesting observation to tell me about. While she was watching a small herd of five or six deer browsing in one of her fields, they suddenly spooked as a big dark bird descended on them. The big dark bird turned out to be a golden eagle that after its fruitless harassment, landed and perched in a tree alongside the field. A short time later, a single deer ventured forth only to again be attacked and chased off by the eagle. Although close by, she observed no actual contact with the deer by the eagle. We discussed how easy it would be for one of these large and aggressive avian predators to snag an unattended fawn in the Spring, something I am sure occasionally happens. Although there are times when the forest and fields seem barren of life and sound, something in itself to take pleasure in, with patience there eventually will be something of interest to see out there; just take the time.